St. Augustine quarterback Rodney Thompson threw a 96-yard touchdown pass in the Saints' win over Carlsbad. CARLSBAD  Mistakes against bad teams hurt. Mistakes against the No. 1-ranked team in the county will get you beat. Carlsbad, ranked No. 10 in the San Diego Section, turned the ball over four times in the first half and five times overall. The Lancers couldn’t overcome their mistakes and fell 28-7 to St. Augustine in a sloppy, penalty-marred contest. Carlsbad appeared headed for the game’s first score but fumbled at the Saints 4 with Brendan Silvia recovering. On the next play, St. Augustine quarterback Rodney Thompson ran a bootleg into his own end zone, eluded the rush and hit Jr Justice at the 40. Justice caught the ball in a crowd, eluded three defenders, and outraced the Lancers for a 96-yard score. 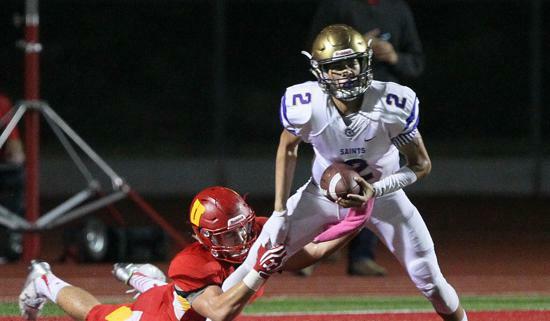 The Saints (2-0) had Carlsbad pinned deep in its territory for two series late in the half and finally got the mistake they were seeking when Tariq Thompson intercepted a pass and returned it to the Carlsbad 2. A holding penalty pushed the Saints back to the 12, but two plays later Rodney Thompson found Tariq Thompson for a 9-yard score. St. Augustine struck quickly to open the second half when Isaac Taylor-Stuart sped 67 yards through the Carlsbad defense for a TD on a draw play. The Saints gave the Lancers (1-1) a gift score when they ran a fake punt out of their end zone on third-and-19. The attempt failed and Carlsbad converted when Isaiah Ramos hit Caleb Schrimpf with an 11-yard scoring pass. The Saints answered when Darrell Broussard took a swing pass from Rodney Thompson and raced 80 yards to a score. Rodney Thompson completed 14 of 21 passes for 281 yards. Broussard rushed 19 times for 87 yards and caught a pair of passes for 96 yards. Justice had four receptions for 116 yards. Next week, St. Augustine puts its top ranking on the line with a trip L.A. Loyola.